Kings Promotions returned to the Sands Casino Event Center tonight with an eight fight card. 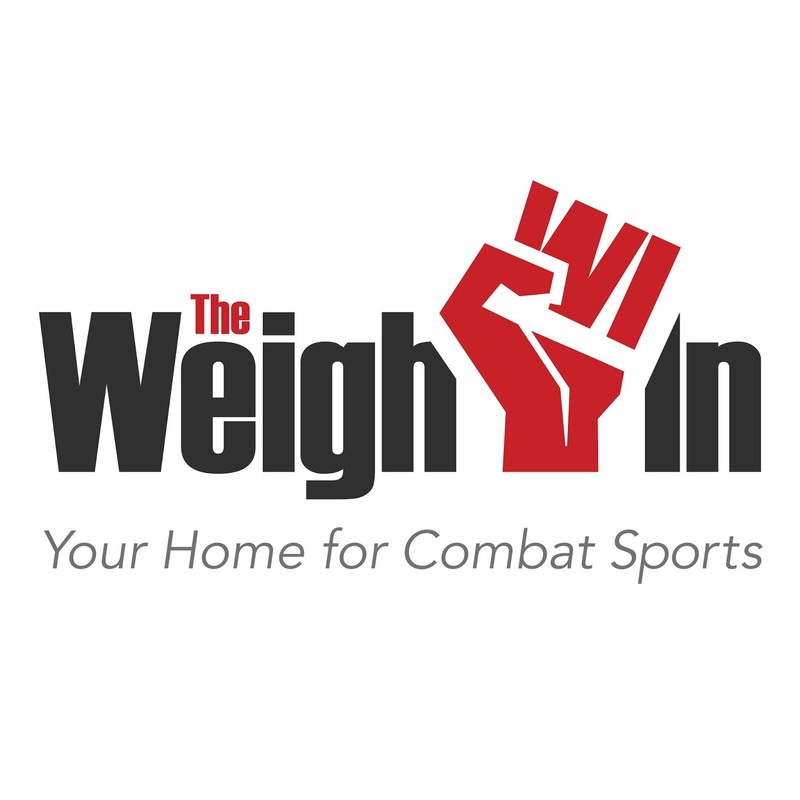 Tonight's action was broadcasted on FIGHTNIGHT LIVE, and streamed by hundreds of thousands of viewers on Facebook Live. 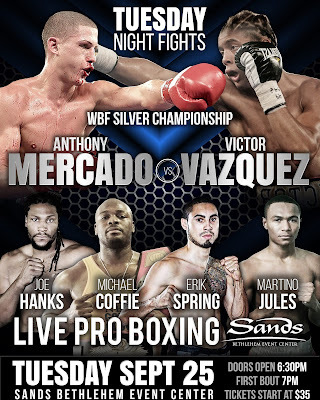 The main event featured an eight round bout between Anthony Mercado (12-4, 9 KOs) and Victor Vazquez (10-5, 4 KOs) for the WBF Silver International Junior Middleweight Title. Mercado vs. Vazquez Part I? In the main event, Mercado started off the action immediately after the bell rang by throwing a series of hooks to the head and body of his opponent. Vazquez looked hurt in the second round, after Mercado landed a big multi-punch combo to his head and body. Mercado, despite the onslaught, was unable to land the decisive blow on the always tough Vazquez. Vazquez gained momentum in the final ten seconds of this round, and beat Mercado into the neutral corner leading up to the bell. Mercado clubbed Vazquez with huge right hands to the head in the third round. Later in the round, he knocked Vazquez down with a multi-punch combo, that was highlighted by right hooks to the head. An accidental headbutt late in the third round sent blood streaming down the side of Mercado's face. Mercado, sensing danger with the cut, landed several big hooks on Vazquez as the fourth round began. Referee Gary Rosato called a timeout to the action later in the round to have the ringside physician look at Mercado's cut. When action resumed, the two men beat the crap out of one another via a brutal exchange of punches in the middle of the ring. In the final ten seconds of the round, Vazquez connected with left and right straights to Mercado's head, that sent blood flying from the cut. Mercado returned to his corner a bloody mess, ensuring that his cutman earned his paycheck tonight. By the fifth round, both fighters' gloves and wrist tape were stained with blood from Mercado's wound. Mercado got nailed with a multi-punch combo as the final bell for the fifth round rang. Fortunately for him, he only had to worry about stumbling back to his corner... In the seventh round, Mercado winced with pain after connecting with a right hand punch. Most spectators feared the worse, that this battle would come to an end due to an injury. Mercado, a Puerto Rican warrior, recovered and exchanged big shots with his opponent as the round neared its end. 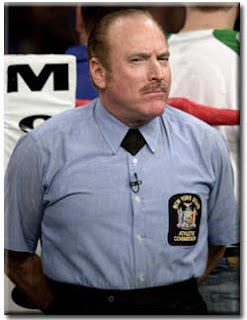 As Gary Rosato called the two men out to the center of the ring to touch gloves before the eighth and final round, the exact happenings of the contest were evident from the blood stains all over his light blue shirt. Mercado, busted open, and Vazquez, eyes swollen up, both swung wildly at one another in the eighth, desperately trying to end the war as soon as possible. Both men hugged and the crowd roared as the final bell rang. The judges scored the bout 76-75 and 77-74 twice, all for Mercado. The question this writer has to ask is: When and where is the rematch? Las Vegas transplant from Michigan, Raeese Aleem (12-0, 5 KOs) continued his winning ways against Alcides Santiago (6-3, 5 KOs), Puerto Rico, in a super bantamweight bout. Aleem controlled the first three rounds by landing the cleaner and bigger shots on his opponent. Santiago was knocked down in the fifth round by an Aleem left hand to the head. Santiago's corner, on advice from the ringside physician, stopped the fight after Santiago took a beating in the fifth of a scheduled six round matchup. Featherweight speedsters, Felix Sosa (1-1, 1 KO), Jersey City, and Martino Jules (5-0), Allentown, fought in a four round contest. Jules answered the opening bell by coming out of his corner swinging for the fences on the unsuspecting Sosa. A right hook to the head sent Sosa crashing to the canvas in this round. Jules pinned Sosa up against the ropes and crushed him with a multi-punch combo for a second knockdown in the third round. Sosa pulled himself up from the canvas, but appeared to be on "dream street." Sosa survived the round, and stumbled dazed back to his corner. Sosa, knowing he was behind on the judges' scorecards, fought aggressively in the final round, but it was all too little, too late. All three judges saw the bout the same, 40-34, for Martino Jules. In a Keystone State battle of super welterweights, York's James Robinson (5-12-5, 1 KO) came up short against Reading's Erik Spring (11-2-2, 1 KO). The two men fought a hard and close first round that set the tempo for the remainder of the six round contest. Robinson, looked winded by the fifth round, showing the effects of a tough contest. The fighters were involved in a vicious, punch-for-punch exchange as this round neared its end. Spring scored a knockdown in the final minute of the sixth round with a big left hook, that upon further review, may have been to the back of Robinson's head. Robinson, outraged by the knockdown call, leapt to his feet yelling at referee Shawn Clark. When the action continued, Robinson fought aggressively looking for a knockdown of his own before the bout ended. The judges scored the bout 59-54 twice, and 58-55 for Spring. Super middleweight prospect Money Powell IV (8-0, 4 KOs) may have faced and defeated the toughest opponent of his young career tonight in veteran Josue Obando (16-23-1, 12 KOs) of Mexico. Powell's power was on display throughout the six round contest, but the 20-year-old product of Fort Mitchell, Alabama (by way of Germany) just could not send his tough opponent down to the canvas. Powell opened up the fisticuffs by snapping Obando's head back with two left hands in the opening frame. Throughout the second and third rounds, Powell punished his opponent with shots that echoed throughout the Sands Casino Event Center. In the third round, Powell ran circles around Obando, all the while landing shot after shot on his visibly tired, yet iron-willed opponent. In the sixth and final round, Powell obviously ahead on the cards, again went into "track and field" mode as Obando, with his hands down at his sides, desperately attempted to stalk his opponent. The judges scored the bout 60-54 twice and 59-55 all in favor of the winner by unanimous decision, Money Powell IV. Nicoy Clarke (2-2) fell to Colby Madison (7-0-2, 4 KOs) in a six round, heavyweight contest. Clarke, who fights out of Jersey City, was the smaller southpaw. Clarke spent much of the first round dancing (literally) as Madison connected on punch after punch. A frustrated Madison answered the second round bell as the aggressor, hammering Clarke with multi-punch combos, which left his eye bloodied and swollen. Clarke hit Madison with a left uppercut from the clinch seconds after his corner threatened to stop the fight if he didn't show them something in the third round. Clarke having survived the round with a second wind, danced his way back to his corner after the third round ended. Clarke went on to put his toughness on display as he battled through the final three rounds with a badly swollen left eye. On that note, mad props to his cutman for keeping the bleeding down on a bad cut. Madison looked tired by the sixth round and moved around the ring sluggishly, knowing very well he was ahead on the judges' scorecards. All three judges scored the bout in favor of Madison, 60-54 twice and 59-55. Michael Coffie (4-0, 3 KOs) faced Curtis Head (4-3, 3 KOs) in a heavyweight bout scheduled for six rounds. The Brooklyn native, Coffie, put his offense on display in the opening frame, knocking down Head with a straight left hand to the head. Head pulled himself up from the canvas only to be knocked down again with a right hook to the body as the first round approached its end. Coffie, smelling victory, continued what he started in the opening frame in the second, when he knocked Head down for the third time with a big left hand to the body. Coffie finished off Head seconds later with a right-left combo to the body. Referee Gary Rosato called an end to the action at 1:57 of the second round. Kenny Robles (4-1, 2 KOs) defeated Corey Gulley (2-3-2) in the third round of a junior welterweight contest scheduled for six rounds. Robles controlled the tempo of the opening frame. In the opening seconds of the second round, Robles knocked Gulley down with a right hand to the head. Robles went for the kill, and appeared to almost punch himself out midway through the round. Gulley battled back after being on shaky legs. Robles let his hands go in the opening seconds of the third round, but got caught with two hard counterpunches. These shots forced the fighter to fight more conservatively in the round. In the third round, Robles beat Gulley into the ropes with a multi-punch combo that sent his mouthpiece flying. Referee Shawn Clark saw enough at 2:13 of the third round. In heavyweight action, "Jersey" Joe Hanks (23-2, 15 KOs) knocked out Terrance Marbra (9-7, 7 KOs) at 2:26 of the first round. Marbra was sent crashing to the canvas by a big right hand to the head. The referee waived off the fight after Hanks clubbed Marbra into the ropes with left hands to the head and body.